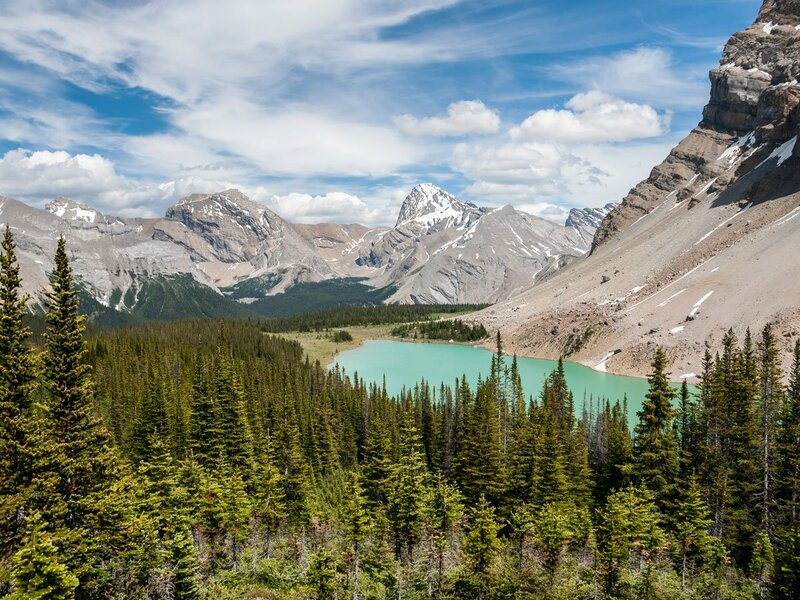 The Devon Lakes backpack is a journey to two remote alpine lakes in the heart of Banff National Park. This backpack is beautifully isolated, being over 30.0km from the nearest road and with 3 mountain passes in-between. This backpacking trip isn't only about the destination, however, as a full 22.0km of the journey (over 40.0km round trip!) is essentially above treeline with alpine meadows stretching as far as you can see. 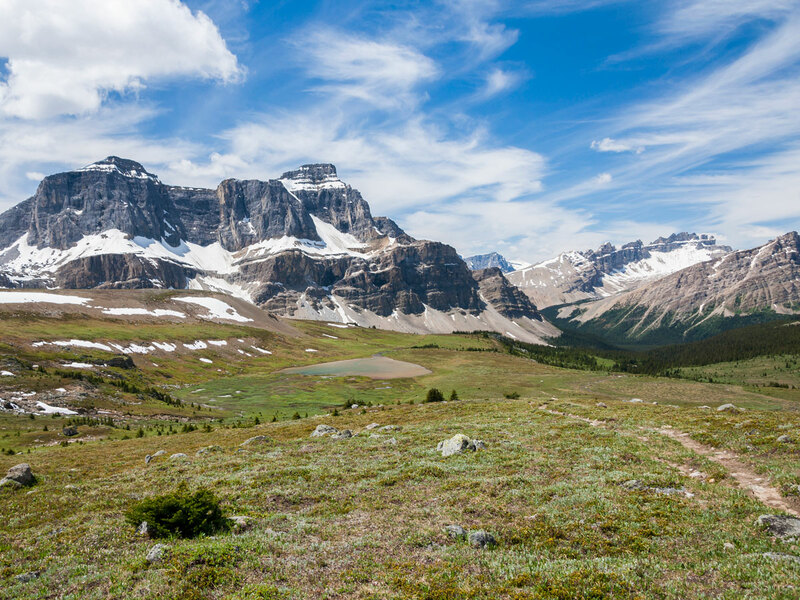 From Lake Louise take highway 93, the Icefields Parkway, north for 23.3km to the Mosquito Creek Hostel. The trip starts at the trailhead across the road. 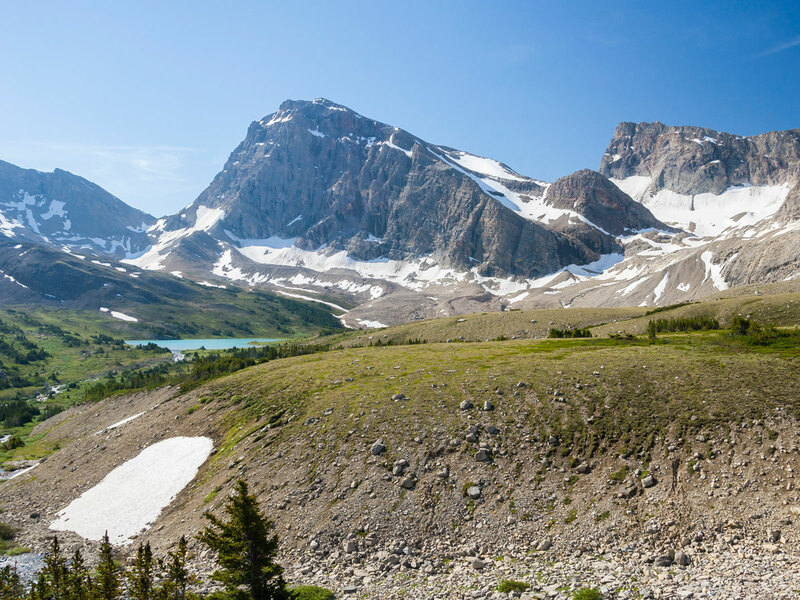 The trail to Devon Lakes starts on the east side of the Icefields Parkway across from the Mosquito Creek Hostel. 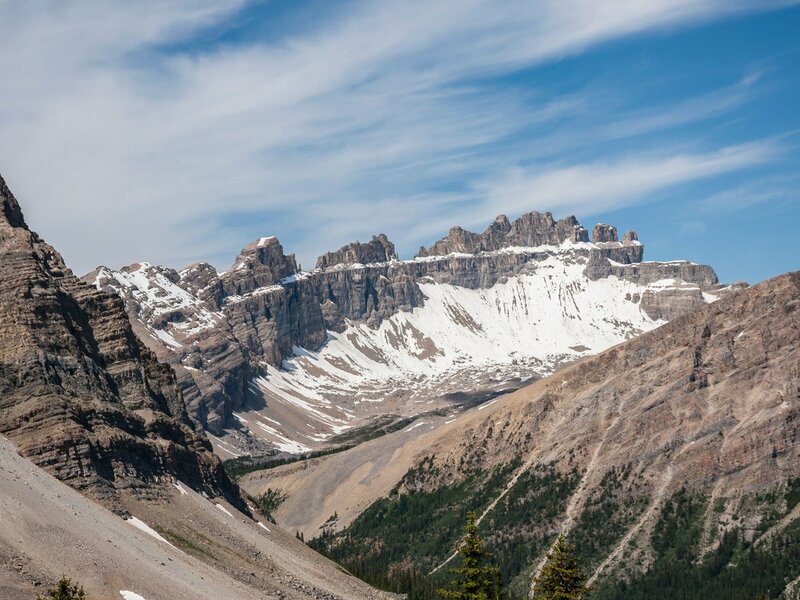 An initial steep climb quickly dissipates into a gentle ascent, reaching Mosquito Creek backcountry campground in 5.0km. After the campground the trail steepens and deteriorates, becoming a mix of roots, mud, and streambed that distracts you from the fact that you’re slogging through forest. 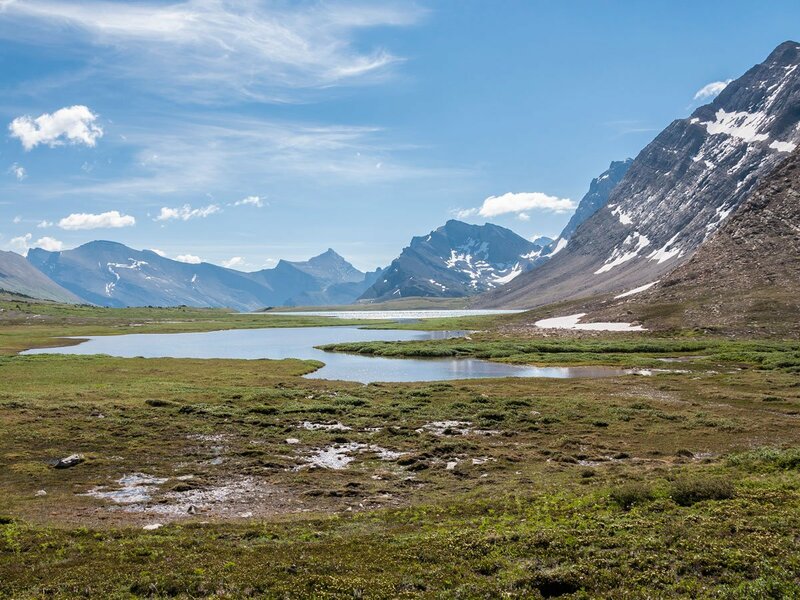 Around the 8.0km mark, however, you emerge into the expansive meadows below North Molar Pass and from this point forward, with a few minor exceptions, you will be above treeline. 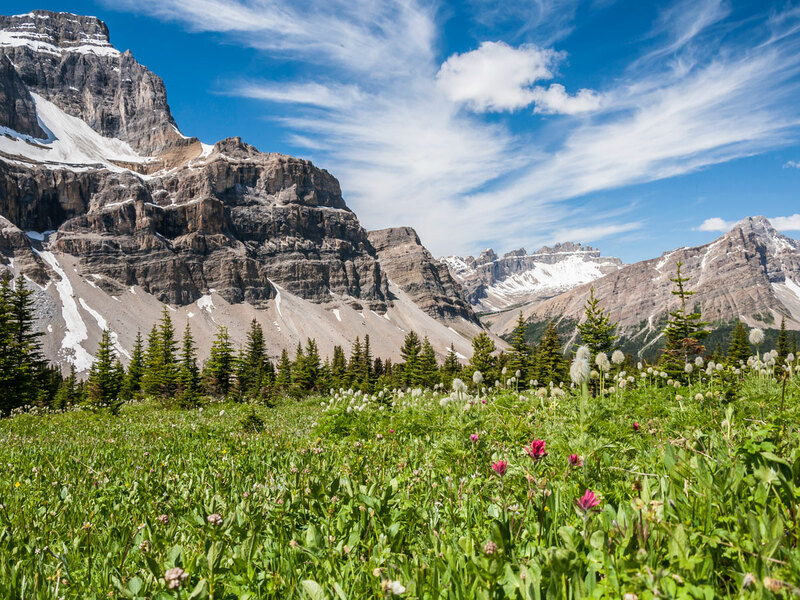 Molar Meadows simply defy description; crossing the meadow you just entered requires an hour or more. Tarns, streams, and flowers are everywhere. 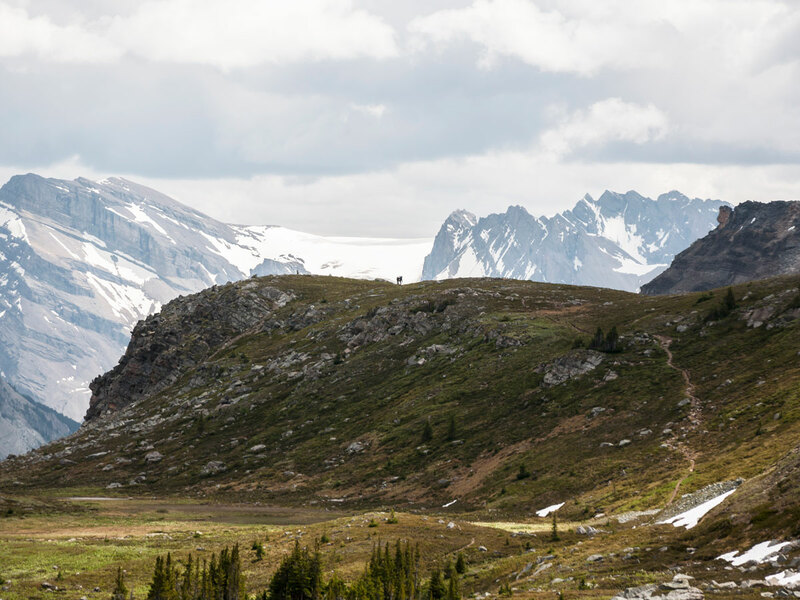 The approach to North Molar Pass is obvious and the final ascent up the rocky slopes is far easier and much shorter than it appears from a distance. 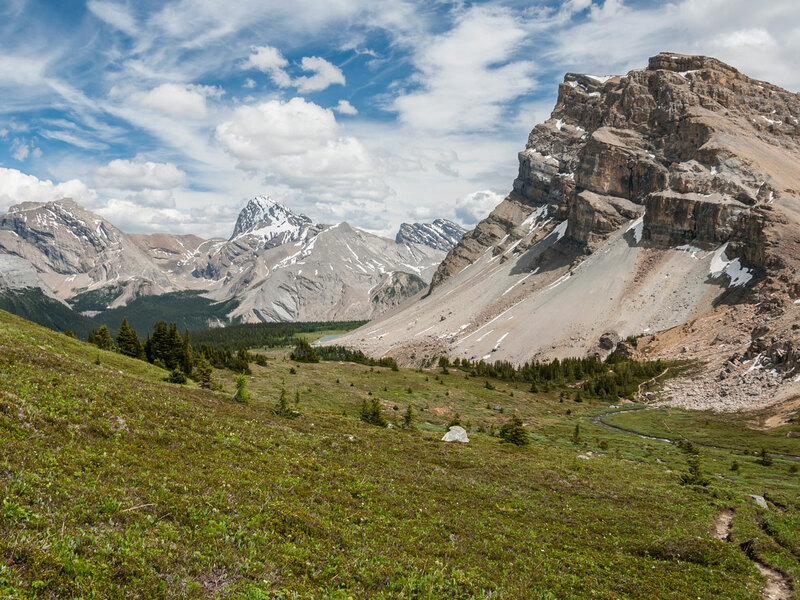 Upon crossing the pass, you are greeted with about 3.0km more of meadows and towering peaks. Your campground for tonight is the Fish Lakes campground, which is about 3.5km away at this point, down through the gap visible to the left in the distance. It should be noted that near the bottom of the descent a stream will be encountered (size will vary depending on the time of year) that is usually too deep to rock-hop. The trail obviously continues on the other side; you can de-boot and easily cross here, or there is a bridge a little farther downstream that can be used to cross. Fish Lakes campground (MO18) has space for 5 tents and can be booked on the Parks Canada Site. It lies on the northern shore of Upper Fish Lake near the eastern end of the lake. There are no defined tent pads, but there is room for 5 tents. While we didn’t notice until we left, the campground appears to have once been much larger and a little exploring to the northeast from the obvious “set your tent up here” spot reveals a few other nice areas to pitch a tent. The campground also has 4 picnic tables, a bear pole, and a surprisingly clean outhouse. Today is a massive day. You may not make Devon Lakes, but get as far as you are comfortable. Start early to maximize how far you can get. By leaving your backpacking gear at Fish Lakes you can do a big day. Take lots of food and even if you only get to Pipestone or Clearwater Passes you’ll be happy with your day! This is a massive day, and you may be tempted to rough-camp at Devon lake, however this is not allowed without Parks Canada approval. 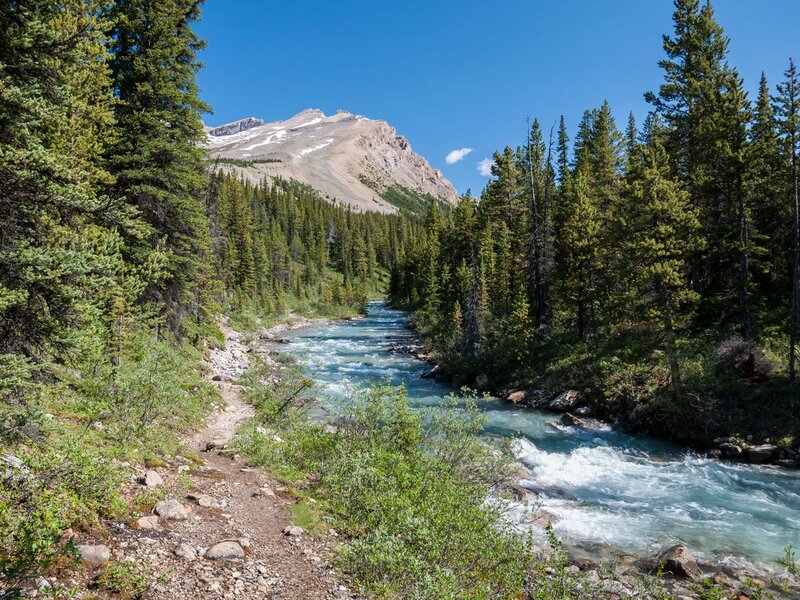 While Devon Lakes can be reached from Fish Lakes Campground by descending into the Pipestone River valley and then ascending to Pipestone Pass, that is not the route we recommend. To get to Devon Lakes, we recommend taking the highline route. 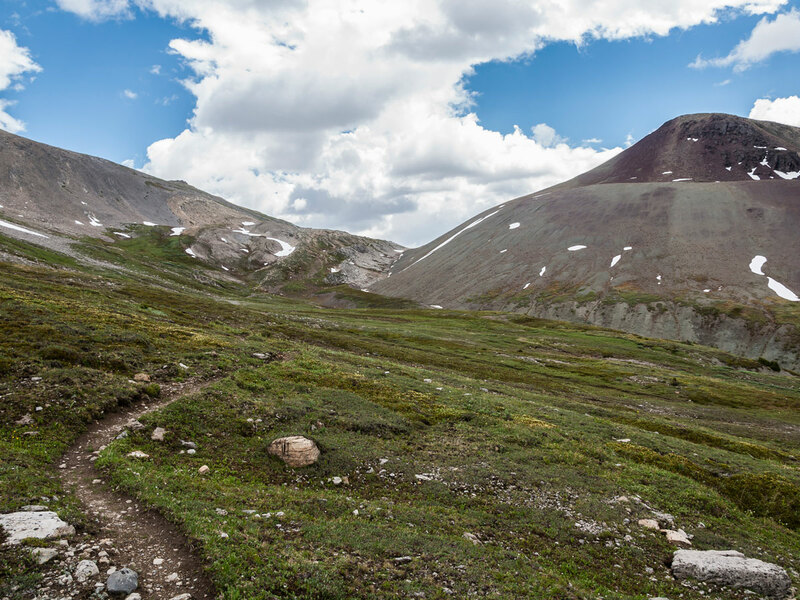 This trail is much higher than the Pipestone route and offers vastly superior scenery and far less elevation gain and loss. To find the trail, head roughly north (downhill) from the outhouse, cross the stream, then ascend the hill. It’s steep, but less than 100m up. As you climb, curve north-northeastwards. With a little route-finding, you will encounter a trail that contours to the north, then descends to Moose Lake. (If you come to the top of a cliff, just follow it north and you’ll connect up with the trail). 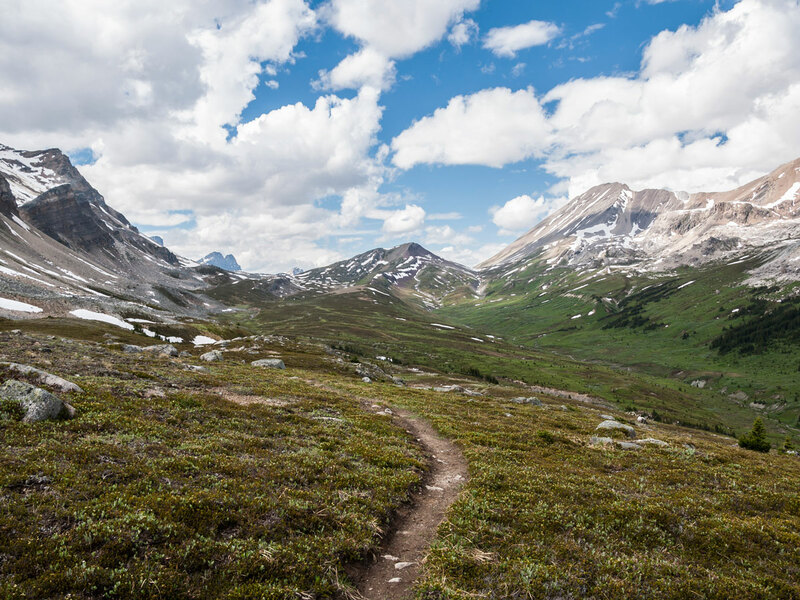 The trail shortly becomes very obvious as it gently undulates through meadows filled with patchy trees, tarns, and streams. From this point forward just follow the trail over Pipestone Pass and into Clearwater Pass. The scenery again defies description. A few forks in the trail on the approach to Pipestone Pass all reconnect later on; just be sure you’re aiming for the actual pass – it is the gap to the east (right), not the west. 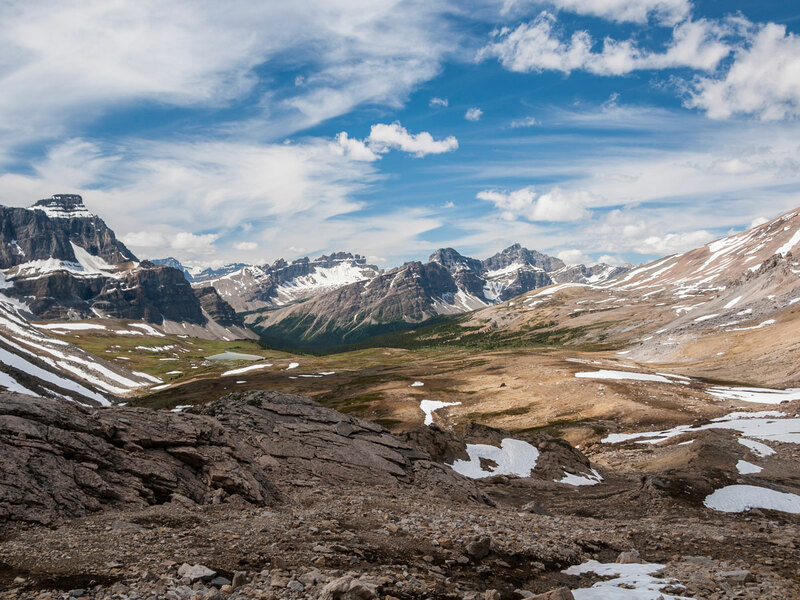 Clearwater Pass lies to the north of the broad mountain (Devon Mountain) flanking Pipestone Pass to the east. When it starts to look like there might be a route around it, keep your eye out for a fork in the trail doing just this. 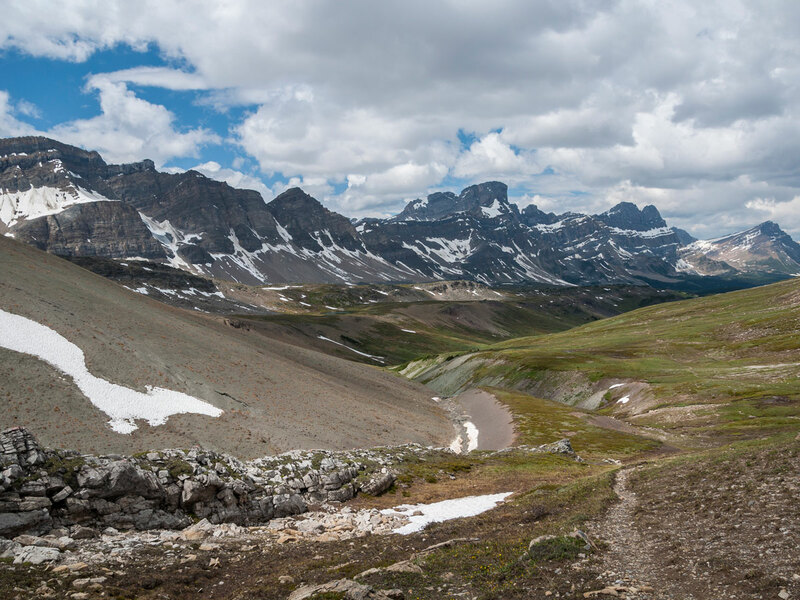 It is marked with a small cairn and while the main trail will also eventually head into Clearwater Pass this shortcut avoids losing elevation that would need to be regained. 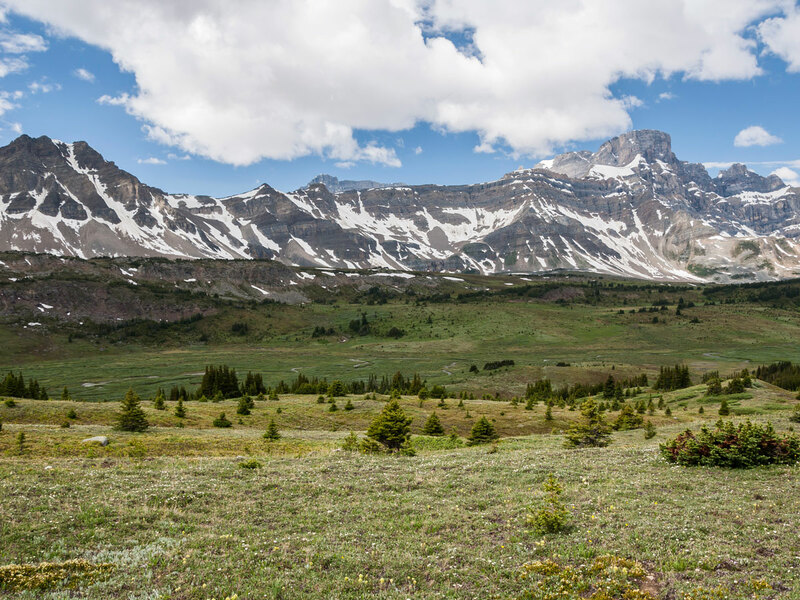 Clearwater Pass is a huge alpine meadow. Near the eastern end are the two Devon Lakes; the further one being the smaller of the two and about 30m lower. 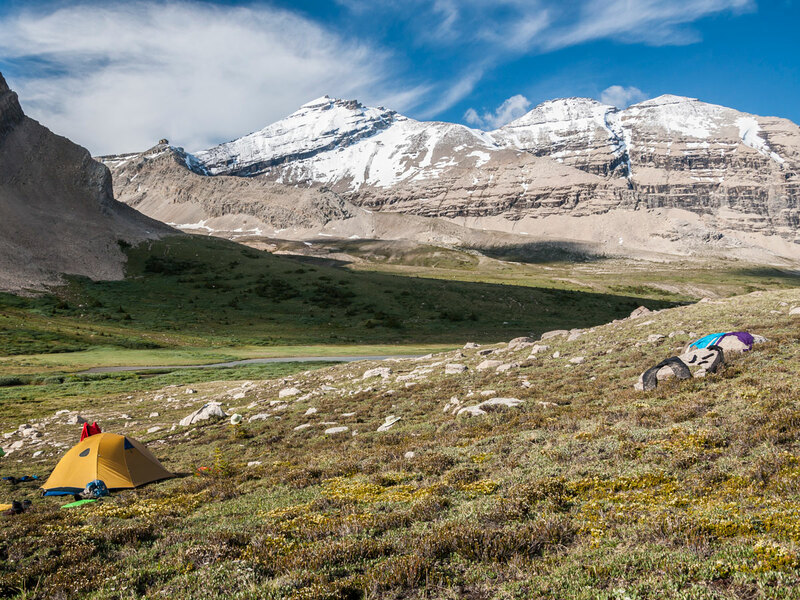 It’s a shame there isn’t a backcountry campground here, as there are superb areas to pitch a tent all around. As testament to how isolated this area truly is, we spent 20 minutes watching a wolverine forage in the bushes near our tent! Surprisingly, other common wildlife was much more skittish, and we only saw marmots and ptarmigan during the trip. The entire trip, however, is prime bear country and evidence of this is everywhere. Be certain to make lots of noise as you hike! 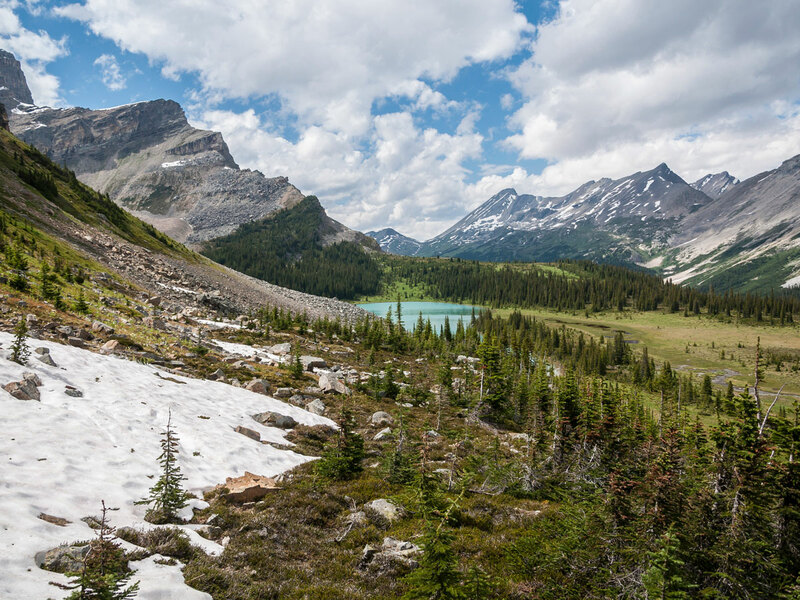 Don’t stay here too long, as you’ll need to hike back to Fish Lakes – take the same route back and enjoy the new views looking backwards, it’s still spectacular. On a long summer day with great weather we often take our dinner with us on the hike. We make this one of those hikes that you take lots of breaks, expecting to leave after an early-breakfast and get back after dinner. It’s stunning to have dinner in the middle of nowhere with these views! Return the way you came from Fish Lakes Campground to your car. 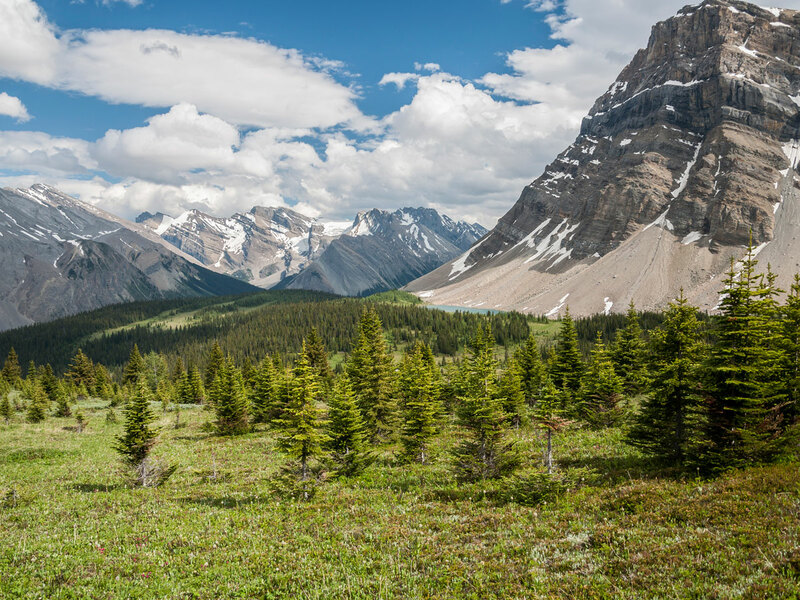 Spending a night in the backcountry in Banff National Park requires a permit, which can details can be found on the Parks Canada site. Spend a few nights at the HI Mosquito Creek Wilderness Hostel to explore more trails in the area! For a great meal head north to The Crossing Resort for three different food options, all casual and all delicious.